Let’s have a look at a few cases involving eDisclosure under the Civil Procedure Rules of England and Wales. I refrain from calling them “eDisclosure cases” because it is important to emphasise that disclosure is simply a part of two things – it is performed in compliance with the wider civil procedure requirements and it is the source of evidence. We can’t get away from the fact that disclosure is a formal stage (“I’ve done this, I’ve done that, Oh God, it’s time to give disclosure”), but the need to look at electronic documents begins much earlier than that formal stage, both for compliance with the rules and in search of the evidence which is needed long before the formal disclosure requirement begins. In this, as in anything involving UK procedure, I am indebted to Gordon Exall, whose Civil Litigation Brief ought to be on the daily reading list of every civil litigator. And yes, I use the expression “UK” in place of the proper, but slightly cumbersome, “England and Wales”. My motto for the season is RTFR, in which the first R is “Read” and the last one is “Rules”; insert what you like for the “F”. Let us begin with a quick scamper through the relevant ones, in the form of a reading list rather than a detailed explanation. The point, of course, is that many of the cases tie back to the rules, and anyone who lays claim to the management of litigation must surely know the rules – “those practising in civil courts are expected to know the rules and practice them; it is gross incompetence not to” as HHJ Simon Brown QC said in Earles v Barclays. This article just deals with the rules. A following article will cover some of the cases which have come my way, many of which illustrate the importance of the rules. Part 1 CPR contains the overriding objective. It is called “overriding” for a reason, and is the source (now expressly so) of the words “at proportionate cost” and of the newly-inserted (as at April 2013) words “enforcing compliance with rules, practice directions and orders”. That seems a statement of the obvious – why does one need a rule to say that rules must be obeyed? We need it for the same reason as I go around saying “RTFR”. Part 3 CPR covers the court’s case management powers. It includes the statement that the court may “take any other step or make any other order for the purpose of managing the case and furthering the overriding objective”. I translate this as “if the court can make any order, then you can seek any order”. Rule 3.9 CPR is the much-tightened (and much-abused) new provision limiting the circumstances in which a defaulting party can get relief from sanctions. That was the source of the appalling Mitchell judgment as modified (or “backtracked on”) by the slightly less appalling Denton judgment on which I say more below. Part 31 CPR covers the disclosure and inspection of documents. It includes the meaning of the word “document” (“anything in which information of any description is recorded”). This is where you find Lord Justice Jackson’s new Rule 31.5 which (put as briefly as possible) imposes duties to discuss the scope, the alternative methods and the “broad range of costs that could be involved in giving standard disclosure in the case, including the costs of searching for and disclosing any electronically stored documents”. Practice Direction 31A covers the form of the list, the disclosure statement, and provisions about specific disclosure – “if a party believes that the disclosure of documents given by the disclosing party is inadequate he may make an application for an order for specific disclosure”. I draw attention to this specifically, because the Mitchell farrago led some lawyers to think that their remedy for an apparently defective disclosure is to apply to strike out the case; it was one of the many defects of Mitchell that it encouraged this. Practice Direction 31B relates specifically to electronic documents. It covers preservation of documents, and pre-CMC discussions between the parties (expanded on by Rule 31.5). It deals with “the reasonable search”, with “keyword and other automated searches”, with disclosure of metadata and with other practical aspects of giving disclosure. It provides for an Electronic Documents Questionnaire to be exchanged in certain circumstances. This lightning summary of the rules is not, of course, a substitute for actually reading the bloody things. The central point here is that you can win or lose a case because you do or do not understand the rules. By “win or lose” I do not mean merely that an adverse judgment (whether substantive or procedural) brings an end to the case, but that good settlements can be won or missed depending on one’s ability to argue from the strong position of knowing what the rules actually say. BUT I am not responsible for the one matter for which I am constantly blamed – sometimes vilified – in the press. I was not a member of the court which decided Mitchell. 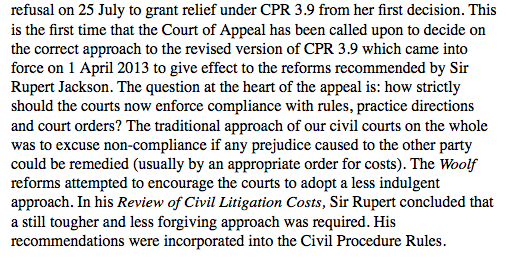 If anyone wishes to see how I think rule 3.9 should be applied, they should read my partially dissenting judgment in Denton v White  EWCA Civ 906. Nearly all the Mitchell-related cases (that is, those determined in the period between the Mitchell and the Denton judgments) are now irrelevant. We can draw two things from this saga which are worth keeping. One is Lord Justice Jackson’s emphasis in his partially dissenting paragraphs at the end of Denton making it clear that the court should not make orders which cannot realistically be complied with – that is important because it emphasises the need for parties to make the assessments (which the rules require anyway) about scope, method and cost to ensure that they seek orders which make some sense – orders which they and/or their opponents can comply with at proportionate cost having regard to the hoped-for timetable and all the factors which make up the case. The other point, the sting in the tail of Denton, is the warning shot fired across the bows of those who take bad points. As with so much else, this is not really a new set of threats but a statement of the obvious; it does put serious pressure on parties to be as reasonable in their challenges as they should be in their disclosure. That is an exercise of informed judgement, and informed judgement is what the clients are paying for. That does not make it easy to determine in advance what is a bad point; dust off a few of those Mitchell cases to see judicial criticism of parties whose challenges amounted to “ opportunism”. The proper course, if you don’t like your opponent’s disclosure and cannot resolve your differences by negotiation, is usually an application for specific disclosure. That much is by way of introduction to the recent cases, something I will cover in a separate article. This entry was posted in Court Rules, CPR, Discovery, eDisclosure, eDiscovery, Electronic disclosure, Litigation, Lord Justice Jackson. Bookmark the permalink.